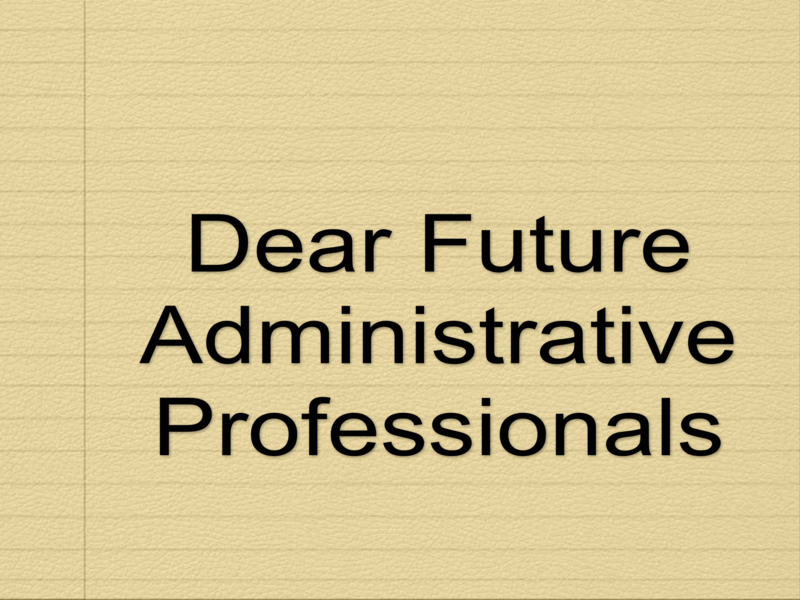 You are about to embark on what could be one of the most exciting careers in your lifetime—the career of the administrative professional. As you prepare for the road ahead, remember to never lose who you are in the months and years to come. Be mindful of your values, and don’t lose sight of who you hope to become. Be a friend to everyone around you by creating and nurturing relationships as people will be your greatest asset. Be confident and thoughtful in your speech. 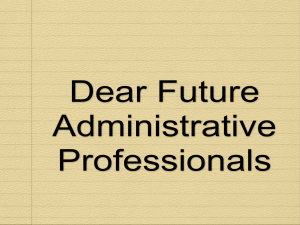 Support and build up your fellow administrative professional colleagues. Choose to be happy each day at work, and you will radiate a passion for the important work you do.The role you play in business and/or government is critical. You are an extension of your executive and/or manager and should want to represent him/her in the best way possible. Strive to become a true work partner. You are also an extension of the business and/or government you represent. People are observing and watching you. You are responsible for building and maintaining your reputation. Choose an industry to support that you enjoy. What is your passion? Is it Technology, Finance, Retail, Fashion, Healthcare, Recreation, Government, Non-Profit, Education, etc. Today there are numerous industries to choose from. Marry your career choice with an industry you enjoy, and you will feel like you never worked a day in your life. Embrace and own your career. Take classes. Join professional associations. Be curious. Ask questions. Value networking, and travel when you can. Follow current local, national, and international events. Become interesting. Be unique. Read, volunteer, and extend appreciation for others. Listen more than you speak. Take some risks. Become an observer. Participate and engage with others. Save your energy and choose to not complain. Become solution oriented versus problem oriented. Demonstrate a desire to say “What more can I do?” Become customer focused and indispensable in your workplace. Welcome and extend lunch invitations to new employees who have yet to make friends. As an assistant, the workload may get heavy. In fact, your work may carry into the late hours of the night, the wee hours of the morning, and/or throughout the weekend. Make sure to stay hydrated, eat, exercise, and sleep. You cannot give your full attention to your work if you do not take care of YOU first! You will be a better assistant when you can give your work 100 percent of your energy. Do not lose touch of the personal relationships that matter the most to you. Family and friends are everything! Your career path ahead will be filled with opportunities and challenges. Seek and accept these new opportunities, and face boldly the challenges. You really have scored one of the best careers in the world. I really believe that! Remember that life is about discovery. Find your passion in the workplace, and take action! How Confident Are You Talking About Money? I love this! Reminds me why I chose this career.